There is nothing better than banana cream pie for dessert. And what about double banana cream pie? Sounds good for National Banana Cream Pie Day that falls on March 2. Cream pies appeared in the Medieval times. People began making pies filled with cream, custard or pudding. Similar inventions we've got from Napoleon's times: cream puffs and éclairs. Oliver Cromwell banned eating pies in England in 1644, declaring them “a pagan form of pleasure”. But anyway pies didn't disappear. No one can tell you an exact day when pies appeared in the USA, but we know when first bananas arrived in the U.S. 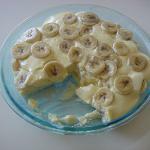 This happened in 1800s and by the early 1900s bananas were used in many recipes, including banana pie. Traditional banana pie calls for a crust made of pastry dough, a layer of sliced bananas, a custard filling and a topping of whipped cream or meringue. Modern varieties of banana cream pies include pecans or drizzles of caramel and chocolate. No matter what is your favorite banana cream pie, buy it in a local store to celebrate this day with your family.